Banana Cream Pie is a-peeling! Banana Cream Pie is a-peeling, yet another personal favorites – really, banana desserts in general. The creamy sweetness of the banana always goes so well with any creamy topping and the slight crunch of the crust is the perfect combination to make your taste buds sing. Holiday pie and holiday music will be front and center Friday (this Friday: Dec. 4, 7 p.m.) when we open our new auditorium with Folkmoot Family Fa-La-La! The holiday concert will include performances by Voices In The Laurel, Saxophone Wassails of the Haywood Community Band, Karin Lyle and Folkmoot’s own Blackberry Jam. Ticket price includes homemade pie, hot cider and a hot chocolate bar – $10, adults; $5 for children 5-18; and children under five are free! Tickets can be purchased at the door or in advance at the ticket office of the Folkmoot Friendship Center. Banana desserts became very popular in the 1880’s when the flavorful fruit become much easier to get in North America, Europe & Asia. 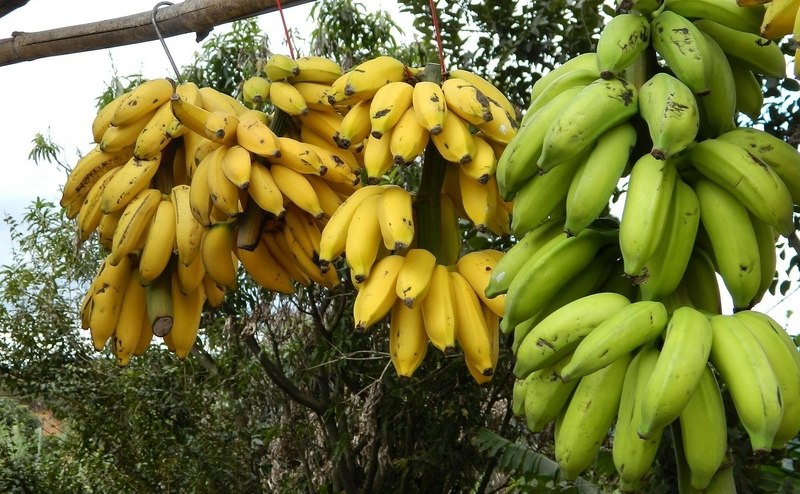 Bananas are, of course, among nature’s healthiest bounties and they became one of the go-to dessert fruits because of their low price and interesting flavor. One of the first recipes for a banana pie had vinegar and diluted jelly inside with a recommendation use boiled sweet potato if bananas were not accessible. Let’s be glad bananas are now abundantly available and we’ve moved on from that suggestion. The next most popular recipe was simply baked bananas with sugar in a pie filling, once baked with a simple sprinkle of lemon juice. It wasn’t until the 1950’s that the Banana Cream Pie we now know was created and enjoyed by all. Here are some very nice banana desert recipes from FoodTimeline. Try them all and bring one or two with you on Friday night to Folkmoot Family Fa-La-La! In a large saucepan, combine sugar, cornstarch, salt and milk until smooth. Cook and stir over medium-high heat until thickened and bubbly. Reduce heat; cook and stir 2 minutes longer. Remove from heat. Stir a small amount of hot filling into eggs; return all to pan. Bring to a gentle boil; cook and stir 2 minutes longer. Spread half of the custard into pastry shell. Slice bananas; arrange over filling. Pour remaining custard over bananas. Spread with whipped cream. Refrigerate 6 hours or overnight. Yield: 8 servings. Folkmoot is grateful for our community!